In a horrific preview of the terror to come, Maoist rebels chopped off the left hand of primary school teacher Narjit Basnet in Rukum in February 1996. Nepali Times tracked down Basnet, and found him exactly where he has been for the last 20 years: teaching Grade 3 of Saraswati School in Musikot, still cradling his text book in the stub of his arm. Dekendra Thapa was a well regarded journalist in Dailekh working for Radio Nepal. When the Maoists stopped the water supply to the town in 2004 during a siege, he offered to mediate. But he was disappeared. In 2008, Dekendra Thapa’s body was finally located, exhumed and forensic examination revealed that he had been buried alive after torture. Krishna Prasad Adhikari was 17 when he went to visit his mother’s family just after finishing his SLC exam in Gorkha. A group of Maoists caught and tortured and killed him by stuffing him inside a sack and dragging him behind a motorcycle. His parents Nanda Prasad and Ganga Maya came to Kathmandu to protest when Baburam Bhattarai was prime minister in 2012. Police got them certified as ‘mad’ and dumped them in Gorkha. The couple returned to start a hunger strike outside Bir Hospital. Doctors kept the couple alive through intravenous feeding, but Nanda Prasad died last year and his body is still in the hospital morgue. 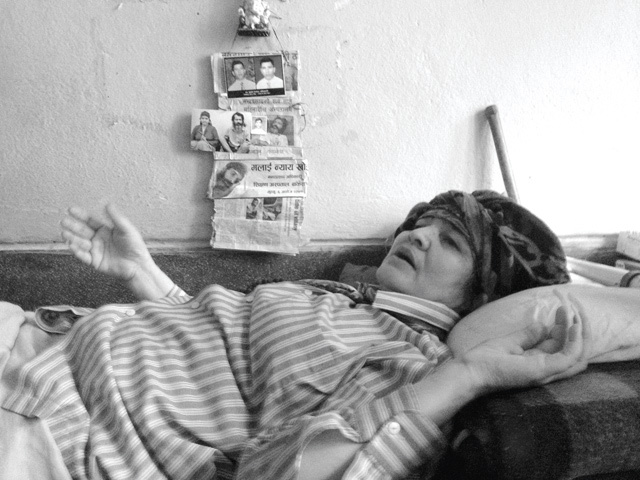 Ganga Maya is on the 52nd day of her fast-unto-death, and her health is deteriorating (pictured, above). In the past four years, she has seen five prime ministers come and go. None have helped her. The International community is complicit with its silence. Many in Nepal want to forget the trauma of conflict. Some families of the victims and the survivors want to carry on with their lives even when they see perpetrators rewarded with high government office, or walking down village streets every day. Partly it is because of a culture of fatalism and a desire to let bygones be bygones. But to a large extent this collective apathy is due to a lack of confidence that a government made up of former enemies will ever deliver justice. The Maoists have shown that it is OK to kill people to get into government, and they never have to answer for the crimes they unleashed. State security, on the other hand, justifies structural violence because it had to counter Maoist brutality. One uses the doctrine of revolutionary violence, and the other says state response under the rules of war is legitimate. But the cases of Narjit Basnet, Dekendra Thapa, Krishna Prasad Adhikari, and many others including the Army’s use of death squads in the Bhairabnath Barracks, its massacre at Doramba and Kotbada, or the Maoists blowing up a passenger bus in Madi, all fall under war crimes. The Maoists, NC and the UML have no desire to revisit conflict era atrocities, and are willing to let each other off the hook. Despite their vicious power struggle, they are all on one side when it comes to transitional justice. They will provide lip service for a Truth and Reconciliation Commission and a Commission on Enforced Disappearances as a sop to the international community, and not really to bring perpetrators to justice. Even though Nepal Army Col Kumar Lama was acquitted on charges of war-era torture by a UK court, it has established a precedence that perpetrators can run but they can’t hide. In the ten years after the conflict ended, there has been lawlessness and ad hocism in governance. The political transition has dragged on because Nepal is ruled by a political cartel made up of the once-warring parties. The immunity from prosecution that they have given themselves is the reason for the impunity in all spheres of national life today. It is the reason for the lack of accountability, for endemic corruption, the erosion of the rule of law and the sinister rise of a parallel state power. When rulers are walking proof that you can get away with murder, you cannot blame others down the line for trying to get away with stealing, cheating, extortion or intimidation. The public’s indifference helps the former enemies who now form the state to wash each other’s bloodied hands. It is now up to civil society and the media to ensure that we remember not to forget, to chronicle the carnage and document the atrocities so that the survivors and the families of the murdered and disappeared get the truth and justice they seek.